The Character of Elsie Dinsmore is designed to help young children to recognize, analyze, and exemplify the godly character traits that are portrayed by Martha Finley's beloved character, Elsie Dinsmore. Thirty-eight godly qualities are defined, identified, and cross-referenced with other positive character traits, using direct examples from the novel Elsie Dinsmore, the first volume in The Original Elsie Classics. Texts from the Bible are also provided to show how these virtues -- definitions come from the Seminar in Basic Youth Conflicts -- can be cultivated and applied to everyday Christian living, including suggestions for practical ways in which these traits can be put into daily practice by anyone. 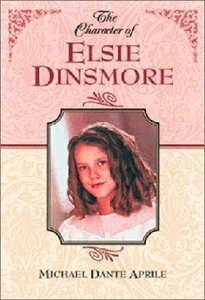 While girls as young as nine years old are the particular audience for Elsie Dinsmore, the lessons in The Character of Elsie Dinsmore are also suitable for boys. A CD-ROM version of the book is available directly from the author. About "The Character of Elsie Dinsmore"
Aprile is a homeschooling father of six children. He and his wife have been homeschooling their children for 11 years. He holds a bachelor's degree in English from the University of Louisville and has been a technical writer for more than twenty years.